The World Wide Web Consortium (W3C) Encrypted Media Extensions (EME) to HTML5 introduce the ability for websites to play Digital Rights Management (DRM) protected content without the use of plug-ins. Internet Explorer 11 on Windows 8.1 supports EME in combination with Microsoft PlayReady DRM. This guide describes how other browsers can similarly enable Microsoft PlayReady DRM playback on Windows 8.1. Browsers have been able to play DRM protected content for some time, most commonly by supporting a DRM enabled version of Adobe Flash or Microsoft Silverlight. These components were provided as browser plug-ins. They, and their underlying media platforms, served to standardize the media pipelines and provided playback for end users at no charge for the plug-in. Plug-ins can limit which devices are compatible with web content, and this has encouraged expansions of HTML that allow browsers to directly support rich features with reduced need for plug-in components. A previous example was the addition of progressive playback of media content added in HTML5. This allowed browsers to play media files directly without the need for any media player plug-in. And now new specifications have defined HTML features that allow adaptive streaming playback of DRM protected media. With the release in Windows 8.1, IE11 supports premium streaming extensions to HTML. These new extensions allow Internet Explorer to play premium video content from a variety of sources, and under a broad range of network and system constraints, without the use of browser plug-ins. The Windows 8.1 design uses Microsoft PlayReady DRM, and works in both the traditional desktop and new experience desktop browser versions. Encrypted Media Extensions: This specification defines extensions to the HTMLMediaElement that support content protection systems. It allows the protection technologies supported by the browser to be identified, and defines methods for key exchanges that support playback of DRM protected media. IE11 supports Media Source Extensions and Encrypted Media Extensions for Microsoft PlayReady DRM. The purpose of this guide is to provide information that will allow other browsers to implement similar capability in browsers running on Windows 8.1. Microsoft PlayReady Porting Kit: Provides a readily deployable implementation and source code that allows Microsoft PlayReady client support on any device, regardless of operating system. Microsoft PlayReady License Servers: Used to host license services necessary to issue licenses for DRM protected content playback. There is also a Microsoft PlayReady PC software development kit (SDK) that provides a Windows desktop runtime for traditional Windows applications that have DRM capabilities. This SDK is still active, but is not the method used by IE11 to implement Microsoft PlayReady support. With the new app model first released in Windows 8, a Microsoft PlayReady AppX Framework was also released. It supports app downloads from the Windows Store, and is staged along with other pre-installed apps so that it is part of the first run experience on Windows 8 and later powered systems. IE11 in Windows 8.1 takes advantage of the staged Microsoft PlayReady framework. Though not a Windows component (it is developed and compiled in separate processes), it is available in all media enabled Windows SKUs and thus is available for new experience browsers running on Windows 8.1. The Encrypted Media Extensions (EME) specification defines a Content Decryption Model (CDM) that translate generic EME APIs into specific data exchanges that a specific DRM solution may require. This allows EME to be generalized, leaving the system specific aspects to the CDM. The Microsoft PlayReady framework used by Windows 8.1 apps includes CDM functionality. And the Microsoft PlayReady Porting Kit for devices includes CDM interface support as well. Using the framework for Windows 8.1 systems and the CDM enabled porting kit for other devices allows Microsoft PlayReady to support browsers running on a wide variety of systems and devices. The goal of this guide is to describe in detail just the Windows 8.1 aspect of this CDM support. The technology was already licensed: As such, no separate license was necessary. The apps would build on publicly documented APIs and ship Microsoft PlayReady enabled systems with no additional licensing. The media pipeline was secured: The Microsoft PlayReady framework uses Microsoft Media Foundation implemented media services, and this pipeline was built and certified to meet DRM needs. Apps were free to use this pipeline with no additional certification (or re-certification on design changes) required. The EME implementation in IE11 uses updated Media Foundation APIs built specifically for EME support. This is the implementation recommended for other browsers (both desktop and new experience) running on Windows 8.1 (and forward). 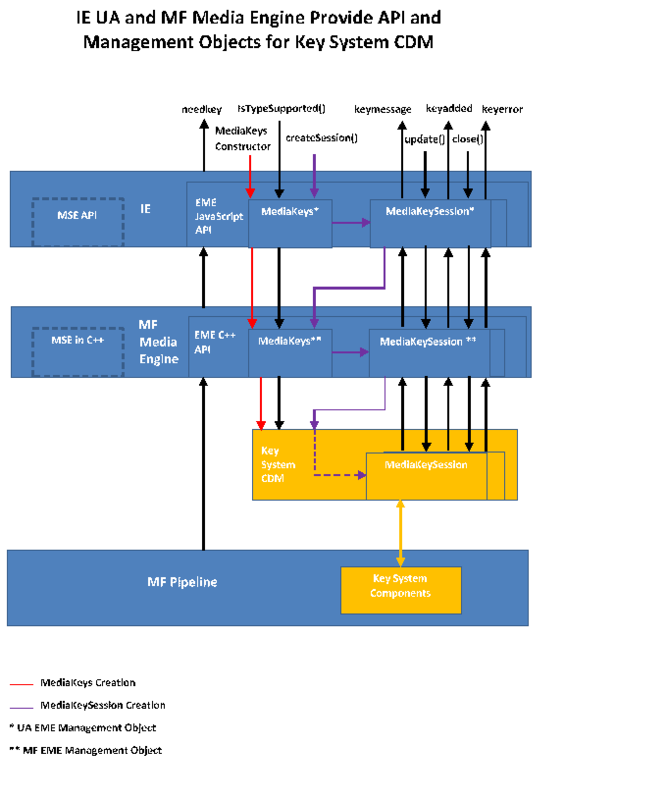 Implement browser MSE/EME APIs using MF New Media Foundation APIs map directly to APIs described in the W3C MSE and EME standards. Attach the IMFMediaSourceExtension Object With MSE APIs mapped to their MF equivalents, the browser must attach an IMFMediaSourceExtension object to an element. PlayReady AppX Framework The AppX Framework would normally be registered based on a dependency declared in an app manifest. For new experience desktop browsers, this is done automatically at first user login. Support In Private Internet Explorer separates the Microsoft PlayReady license store for In Private use and deletes it when the In Private session is ended. This removes licenses that may have been stored during the In Private session. Support Tab Suspension Tab Suspension separate tabs on new experience browsers into separate processes, and allows power management features in Microsoft WindowsWindows to manage which tabs remain active in background and which are suspended to improve the browser power profile. Tab Suspension has specific implementation requirements that browsers must meet to insure media experiences work properly. This flag is defined in MF_MEDIA_ENGINE_STATISTIC. Note, pass MF_SD_LANGUAGE as the value for the guidMFAttribute parameter. Implement URL.createObjectURL (MediaSource mediaSource) per the W3C MSE standard. When a MediaSource object URL is set as a media element's source, pass the URL to Media Foundation through the IMFMediaEngine::SetSource method. When creating an instance of the media engine, pass in an object that implements IMFMediaEngineExtension by setting the MF_MEDIA_ENGINE_EXTENSION attribute on the IMFAttributes store that is passed to IMFMediaEngineClassFactory::CreateInstance. Implement IMFMediaEngineExtension such that calling BeginCreateObject with type=MF_OBJECT_MEDIASOURCE along with a MediaSource URL causes the associated IMFMediaSourceExtension instance to be asynchronously returned via the provided callback. Four frameworks will be staged in Windows 8.1. There are pairs for x86 and amd64 variants. In addition, compatibility with Windows 8 Windows Store app required a specific version be maintained for them (under the family name Microsoft.Media.PlayReadyClient), and a new version provided with the added EME features. The AppX PackageManager tracks app dependencies on AppX Frameworks. These are normally declared in the app manifest, but new experience browsers are built as desktop apps and don’t have a manifest option. They must take an explicit reference on the framework to notify the Package Manager that the framework has a desktop app that needs the framework installed. That insures that the Package Manager will keep the framework active even if all Windows 8 Windows Store app that need it have been removed. AppX Frameworks are normally restricted to use by Windows Store app only. In Windows 8.1, the Microsoft PlayReady app package can be used by desktop or new experience desktop browsers. This happens automatically if the browser implements EME with Media Foundation APIs. IE11 deletes Microsoft PlayReady licenses acquired during In Private browsing sessions. This practice is recommended for other browsers that implement EME. The new Microsoft PlayReady framework allows the app to specify the license store location (also called Hased Data Store or HDS) for any session. This default HDS is also specific to the app using the framework, so that licenses stored in it are isolated by app. The default HDS also includes Indiv data and any persistent licenses that may be acquired. For this reason, Microsoft recommends that it not be deleted. IE11 uses the default HDS for normal EME sessions, and specifies a separate HDS for In Private browsing using the Microsoft PlayReady HDS path feature. That allows the In Private HDS to be deleted with no impact on Indiv data or persistent licenses. Browsers can do the same thing using the optional cdmStorePath parameter of IMFMediaEngineClassFactory2::CreateMediaKeys2 to specify the directory path the Microsoft PlayReady CDM. Windows Internet Explorer deletes the entire cdmStorePath directory when the In Private session ends. This means that any persistent licenses stored during In Private are deleted. IE11 implements tab suspension to help minimize power consumption when users are using the browser. Tab Suspension allows browser tabs to be separately managed for background operation. Using tab suspension, Windows can manage demands on CPU when browsers have many tabs open. Create a new Media Keys instance for the key system in the frame process. Call IMFMediaKeys::GetSuspendNotify to retrieve the key system’s suspend handler. The key system may return the HRESULTE_NOTIMPL when it does not need a suspend handler. Before suspending the tab, call IMFCdmSuspendNotify::Begin. If the suspend handler returns anything other than S_OK, abort the tab suspension and try again in a few minutes. After suspending the tab, call IMFCdmSuspendNotify::End. Release the suspend handler and media keys created by the frame process.